Even if you are not a car geek, a simple $20-$25 Bluetooth OBD2 adapter off of Amazon or eBay can go a long way spotting car troubles and avoiding the "mechanic's premium" that blows a problem out of proportion to gauge a bit more money for the repair. It also goes a great length towards clearing accumulated errors that fire up the engine check light and might kick your motor or transmission in security mode at the least suitable time. Or you could simply want to observe your car's behavior and stats in a little more detail in real time, down to "suspicious fuel trims increase" or "MPG without idling/jams". You can also overlay this info on real time video recording of your trip tagged with GPS data to serve as proof in case of an accident. How do you read the sensor data coming from the OBD port in your vehicle on the cheap, though? Easy, just get a decent Bluetooth adapter for your OBD port, and load your Android phone with an app that lets you follow your car's vitals in real time, clean errors, record accidents and diagnose problems. We've rounded up a few of the best OBD apps for you below. The most popular OBD reader app in the Play Store, Torque Pro defends its reputation with a laundry list of features and sensors it can follow, and the numerous widgets and plugins that use it as base, adding loads of functionality. You can have fun with building customized dashboards, clock your 0-60 or a quarter mile times, find and clear accumulated error codes, and even videotape footage of your trip with OBD data overlay, or send GPS tagged tweets on your next roadtrip. $21 for the full version of hobDrive is a bit hard to swallow, but once you try one of the most underestimated OBD apps in the Play Store, you might wish to shell out the two tens for the full app anyway, especially if you have a hybrid vehicle. How about "Permanent tracking for engine codes (warns you in trip), MIL codes explanation; tracking for overheat and suspicious fuel trims increase; total trip MPG, MPG on hot engine, MPG without idling/jams, MPG by Day, Week, since last fueling; zero to Hundred, Quarter, Brake time, Horse power calculation, torque," all wrapped up in a pretty interface package, and that's precisely what hobDrive offers to car geeks. The app also lets you have fun with an improvised HUD display with reversed image that reflects the data from the tablet on your dashboard on your windshield at night. In addition to reading the data coming from your Bluetooth OBD adapter, CaroO Pro is geared towards serving as a blackbox for your vehicle in case of any incidents. It can use your phone camera to record footage of your trip, complete with collision detection, as well as overlay GPS coordinates and follow the car's vitals, so in case of a crash you can have more chances to prove whose fault it was at the moment. A basic and functional free app, OBD Car Doctor reads the data sent over from your adapter, and reports "real-time engine and vehicle parameters: speed, rotation, temperature, pressure, lambda and multiple other sensors data supported by your car; chart drawing for real-time data; check engine light control: read and clear stored error codes and related freeze frame data." Torque Pro can be a bit intimidating for the average user with its myriads of features and settings. For a more user-friendly layout and similar functionality, you can check out OBD DROIDSCAN PRO, which is cheaper, allows you to enter custom PIDs, and is done by folks with years of experience in reading OBD data and tuning performance accordingly. You can export the saved scans to Excel for easier reading later. Good article. I'm not complaining, but it would of been nice if you included a rough estimate of what the OBD adapter would cost. Now I have to go to a website to see if the price is even something to consider. My ELM327 was only 9.99 off of Amazon with Amazon Prime. 19 bucks free shipping on ebay. Been using Torque for 2 years now, great app! Thanks for the nice article but I think you are missing one of the best OBDII apps. Have you tried OBDAutoDoctor? I think it has the most professional user interface of them all. Great, an OBD2 adapter for $20 is really cheap. If you already have an OBD2 adapter, why not try some other fun OBD2 apps... I can recommend SoundRacer OBDII Engine Sounds at Google Play. It will make you smile. Great article. For true accurate OBD data readouts and code reading, Torque is a great app if you are an advanced user and know what you're doing. it is the best! 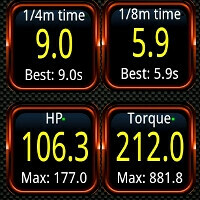 Also OBD Droidscan has a few less features than Torque, but is extremely user friendly and works excellent every time! Both are my favorites and I switch between them regularly for my auto business. And both have excellent support teams! You can't beat cost vs functionality of OBD Droidscan! But it is hard to say it is my favorite with Torque being so good. Depends what you're looking for..
one thing about this app. can it update external server online , letting monitoring from outside the drivers cabin? lets say office headquarters, or just home? Best application for audi drivers that I found is OBDeleven, it can be found on google play. It requers special dongle that cost 29Eur, but with it you can read trouble codes from all systems, activate aditional functions as cornering lights, lap timer, engineering menu, dont know how is with functions to other cars, but with my Audi A5 2012 it working well. Highly recommend this.